It's time for our second Gold Cup Doubleheader-- this time, featuring a team that's not actually in the Gold Cup, Guatemala (they were actually suspended from the competition.) and El Salvador, who faced the United States in the Gold Cup quarterfinal and lost. Let's get to it, shall we? I've always actually really liked the flag of Guatemala and thinking about it, I think it's the quetzal bird that does it for me- the long tail that runs the length of the central emblem is just about perfect- but the other aspects of the flag work as well. The blue stripes are meant to represent the two oceans that the country lies between- the Pacific Ocean and Atlantic Ocean as well as the sky above the country. The white stands for peace and purity. The overall blue and white color combination should be familiar- especially if you're all about Central America and it's early history as it recalls the flag of the Federal Republic of Central America. Then, we've got El Salvador. Adopted on May 27, 1912 for national and civil usage, you can immediately see the blue and white combination from the Federal Republic of Central America is still strong here- which makes a certain amount of sense from the historical and geographic point of view- Guatemala is right next door, after all. 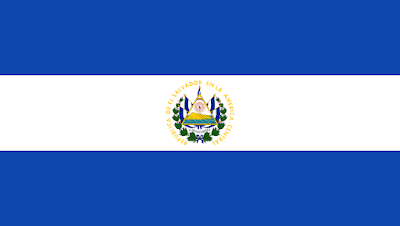 There are some differences though- El Salvador uses a darker shade of blue, royal cobalt blue, which stands for the great sky and two massive oceans of Central America. White is for peace and solidarity with the world and the golden amber is for what Wikipedia refers to as, "the entire bold phraseology in the flag." Whatever that means. 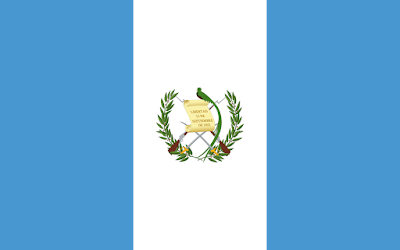 In the center you've got the Coat of Arms- which, like Guatemala's is quite striking. It's pretty packed with symbolism, so I'm going to let Wikipedia do the talking on this one. If dig heraldry, it's worth a read. So there you have it- Guatemala and El Salvador. Remember until next time keep your flags flying, FREAK or otherwise! *The other flag with a firearm is Mozambique.